CAR’s Ben Barry gets a guided tour of the long-awaited 991 GT3 RS from a man who truly knows it inside out: Porsche’s GT division boss, and ‘Mr. GT3’, Andreas Preuninger. If you’re a 911 fan, make yourself a brew and enjoy as detailed a walkaround of the new GT3 RS as you’ll find. Read on to find out why it’s got such massive wheels, how it more than doubles the downforce of the 997 GT3 RS 4.0, and why spending ‘horrendous’ money on a crankshaft made from ‘Star Trek steel’ was worth every penny. 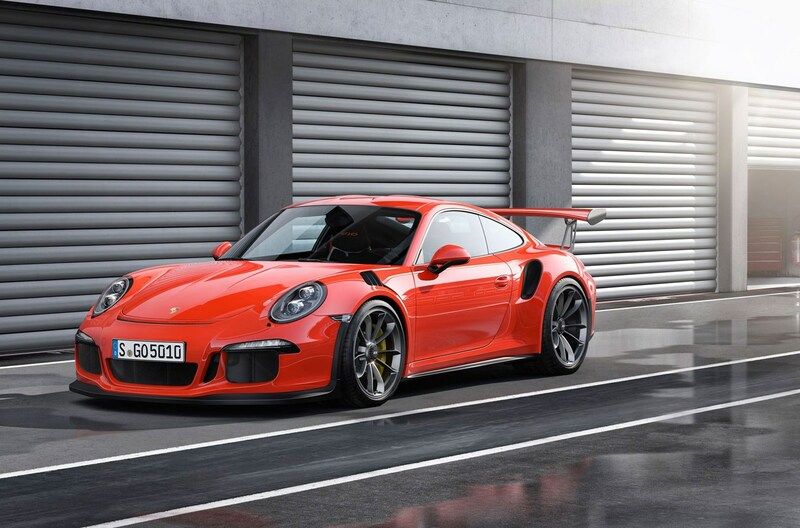 Q: When did you choose to go to a 21-inch rear wheel on the GT3 RS? AP: At a very early point, because we found out that this new rubber from Michelin that we use on the 918 was out of this world – such a great sticky tyre. It contributes such a lot of performance, it’s really tyre technology to the next level. We wanted to use exactly that tyre from the 918 and all the initial CAD showed us no way, it doesn’t fit. [It] touches on the outside, touches on the inside but I said no, we have to do it. So the next problem was with the production line – and this is true – they are too wide for Zuffenhausen. When the car is coming along the production line, there is a big slat where all the four tyres go down and the workers grab them and put them on the car. But the slat is not wide enough for the 21s, so they got stuck. So we said okay, we had to invest an outrageous amount of money for new, wider slats. There were a lot of stones in the way for that tyre. Q: And helps downforce perhaps? AP: A little bit. The more you pitch the car, the more downforce you get on the front axle, and more lift on the back, so you have to find the sweet spot. It’s a little bit higher than the GT3, because of the tyres. It doesn’t show, somehow, but it has about 8-9mm more ground clearance at the front, too. Q: And the slats in the front wings help downforce? AP: They don’t only help downforce, they are absolutely doubling downforce. This is such a unique feature, so important. By opening the front fenders, and allowing air to get ventilated out of the wheel arch, we contribute big-time to the front end downforce. And the problem with the 911 is if you want to create much more downforce and still have the car in balance, you need a certain amount of downforce on the front and the back. It should be one third on the front, two thirds on the back, so making downforce on the back is something for dummies. You just need a wing, you put it in the wind and it presses the car down, but you have to have a counter measure at the front to have a stable car. Otherwise it pivots around the rear axle and you get loose steering, so the key contributing factor in getting that much downforce is that opening in the front. To give you a comparison, the 997 GT3 RS 4.0 was top of the pops, it was 170kg at 300kph (186mph), which is quite substantial. And this car has more than doubled the downforce, with 350kg at 300kph. This is exactly the same as the 918 while still maintaining, and this is the big point, the same co-efficient of drag as the GT3, which has 110kg of drag. This is unheard of before, something we are all very proud of, very hard to achieve. And you feel that, because that amount of downforce kicks in much earlier, because it’s a linear function. If you’re going on a normal road, 150-160kph, you already noticeably feel the effects. AP: Exactly. You’ve got half of it at 150kph (93mph), and this is still more than the RS 4.0 had in total. And that’s in addition to the mechanical grip with these very wide wheels and huge contact patches, and that rubber compound, and 9.5in wide at the front with 265s. This is all one big performance plus that is making this quantum leap. Q: So is aero the biggest step over the GT3 or is it tyres? AP: I never thought of that, really. The aero is a huge step and the tyres are the next step, but not as much. They are maybe 20% more sticky than the GT3, but the aero is more than 300%, to put that in perspective. I don’t want to bash the GT3, no way, but it’s a different animal, we have different mission criteria. Only a few people want to go to the opera with a wing like that, it’s for a purpose. We wanted a step further with that this time. Q: What about the engine, when was the decision to go to 4.0 litres? AP: I think it was from the start, we knew that this engine could be hopped up by displacement, and we had this RS 4.0, so the 4.0 litres were introduced already. So we didn’t want to go back on that, but this is not a limited model – it is the successor of the 3.8 RS if you look at it correctly, but still we want the 4.0 – it’s a great engine. It’s not only a couple of horsepowers more, like on the Mezger engine [where] we shared a lot of parts between GT3 and RS, not in this case. There’s a different crankshaft, the material is only used on the 919 racecar – a highly, highly clean metal that is melted and solidified several times to get it as pure as possible, and more durable. It’s steel, but a very special like Star Trek steel. It’s a horrendous expensive part, but it works and that’s how it should be. We’ve got different con-rods, different pistons, different camshafts, different cam springs, different oil system – so we touched a lot of internal parts. Q: What was the overall idea: power, driveability? AP: Power. We wanted the RS to be more track performing, to up it a little, and the 500bhp is not the real data of this engine, which is kind of normal for GT cars, we have to homologate the engines way before the start of production, and we always find something else in the process, so it’s 500 on paper but a good deal more in the real world. But I like to be humble about that. AP: 510, 515bhp, something like that. There are other companies that are always taking the 2% rule and upping it because that’s allowed by the government, but we don’t do that. Maybe we’re stupid, but I don’t want to. We always have a little more. Q: So the actual capacity is from a longer stroke… are the revs lower? AP: It’s 200rpms off, but [it’s] not that it cannot do the 9000rpm, it’s just that there’s no point, because with a longer stroke your power curve drops… it should explode up to the redline, and then you have to shift. If you close your eyes – which you shouldn’t do while driving the car – and rev to 9000 or 8800rpm, you will have a hard time recognising the difference. Q: With extra downforce, presumably there’s a lot of extra work with suspension components? AP: Yes. And with the wing and the struts, because there’s a lot of power, of weight, on that wing. At full bore it’s like three of us sitting on the back wing. Things have to be stable or they fly off, you can’t let all this weight be transferred to the body in white by plastic parts, it has to be a structural connection between the struts and the body in white, to push the car down. Q: Are the actual components unique in the suspension vs Turbo and GT3? AP: The components have nothing to do with the Turbo’s. They are roughly the same on a GT3, but we have a lot of different stuff because we have a 50mm wider axle, and it’s wider at the front. They are special parts for this car, all forged aluminium, all race-bred, the homologation parts for the RSR [the racing version]. They are a little bit more beefy than they would have to be only for street use, but that’s part of the homologation process, and I can live with having some extra strength to the parts. AP: We wanted to fool people looking at spy shots, I was so amused… they were saying, “oh no, it is a turbo!” We are not using this for intercoolers, we are using this for the intake, so we develop new ducts that go directly above the wheel, through the body in white, and into a race air filter, and we have cleaner air at the side of the car. [It] was just a solution to get more power and being able to use the super-wide Turbo body – because otherwise we would have made new sides without the hole, which would have been mega expensive tooling. So we’ve made this situation a positive. Normally we have the intake at the back of the car, so the air has to go over the roof, and when it leaves the roof it tends to get dirty, as we say, there are some swirls in it, the stream is not as linear as it is on the side of the cars. We have a better ram-air effect on the sides. The side effect is the car has a specific sound, the intake goes partially through the body in white, which is adjacent to the interior of the car, so you hear the induction quite a lot more than you do on a GT3, especially when you have the windows down. I like that, it adds to the specialness of the driving sensation. Q: And both sides are effective, or is one side a dummy? AP: Yes, both sides with one big airbox at the back of the car. Q: And the wider track makes a big difference? AP: It does, it’s a 1808mm, so you can fit bigger wheels, bigger contact patches, you only have advantages. We made the front a lot wider than the Turbo, because the front fenders are a lot wider, so we copied this maximised track from the back to the front to put it in balance again, and then we constructed the fender around it. The fender is carbonfibre and weighs half [the amount of] the fender of the GT3. The front [boot] lid is carbonfibre, 1.5kg lighter. A highlight is the roof, which is magnesium sheet metal – which is not available in any car, not even race cars. It’s an entirely new process where you have to get three sheets of magnesium sheet metal that have to be welded together and brought into that shape, and it’s 1kg lighter than carbonfibre would be. How cool is that? Q: But a lot of expense for 1kg? AP: It was worth it; 1kg less at the top of the car, not so bad. We have a lot of [other] areas [where] we can save weight, but on the other hand the 21 inch wheels and huge tyres weigh more, so we have to compensate. Q: So is this maybe why this is the smallest difference in weight between GT3 and RS models? AP: Yes, the wheels and the body. The body as a percentage is even wider than it was before… you don’t notice the weight, the car feels so light. It’s well worth having those systems, because with this car we want to be pole position, we want to be best on the track. That’s why it’s PDK, not manual, that’s why it has the rear axle steering, because we need it there. That’s what an RS stands for.